Engineered marine pumps to solve your special problems. The Leistritz five-rotor, single-flow screw pump on the left was specially designed to unload asphalt and #6 fuel oil from an ocean-going barge. BPH, are the largest of their type ever installed aboard a U.S. vessel. SSU and temperatures to 340° F.
While engineering and manufacturing marine pumps to solve all kinds of fluid-handling problems has been a Leistritz specialty for more than 60 years—we make a full line of standard pumps, too. The line includes two, three and five-screw pumps for lube-oil service, fuel-oil service, hydraulics, sludge handling, cargo loading and unloading. And these pumps serve both shipboard and off- shore applications worldwide. So whether you have a special pumping problem to be solved, or an application that a standard pump can handle, you can count on Leistritz for a pump design that will—without compromise—meet your exact pumping requirements. And at the same time, you'll get the quality, reliability and efficiency that Leistritz is known for. 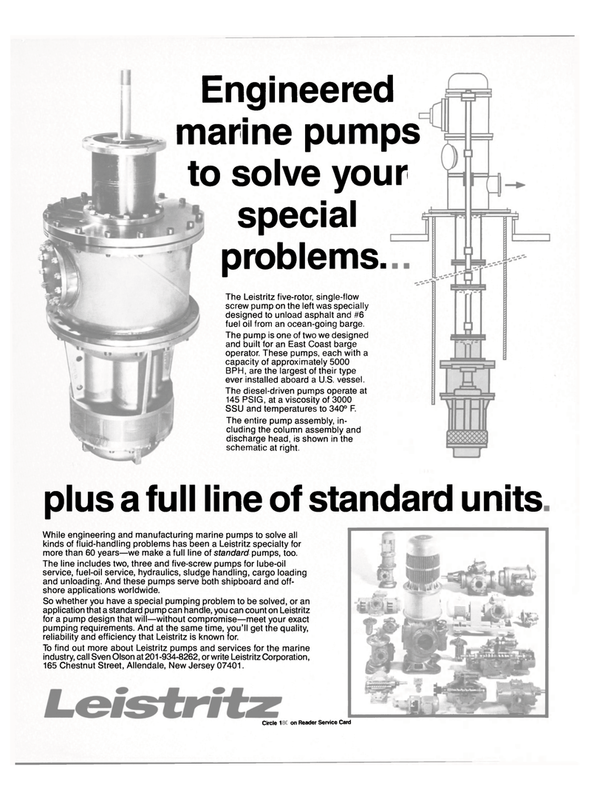 To find out more about Leistritz pumps and services for the marine industry, call Sven Olson at 201-934-8262, or write Leistritz Corporation, 165 Chestnut Street, Allendale, New Jersey 07401.